While waiting for some figures to come in for my FSV build, I decided to convert a Fujimi Jagdpanzer 38(t) into a Flammpanzer 38. 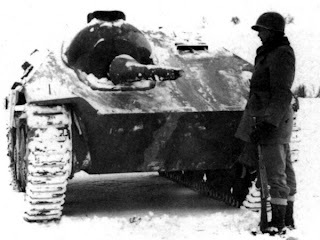 I'm not quite sure what they were thinking when they designed the UM Flammpanzer 38, but there are a couple of easily corrected problems with it. From what I have seen, Flammpanzer 38s were late model vehicles, while the instructions for the UM kit would have you build it as an early model. The instructions also say not to include the machinegun in front of the loader's hatch, but from what I have read, it should be there. Finally, the gun mounting needs to be modified. But enough of the UM kit, what I built was the Fujimi kit with some UM parts. The Fujimi kit was built pretty much as directed in the instructions. I added a bit of sprue to allow the UM barrel to be attached, and used a piece of plastic card with a hole drilled in it to wall off the area behind the mantlet. I also used some plastic strip to make the rail over the periscope. It should be curved, rather than angled like the one from the Fujimi kit. I fixed up the barrel by drilling out the center, and then gluing a bit of plastic rod (also with the center drilled out) inside of it. Some scrap plastic was used as the small protrusion at the end of the barrel. The barrel was kind of flopping around, so I had to add a wad of UHU Tac around the ball joint to firm it up. 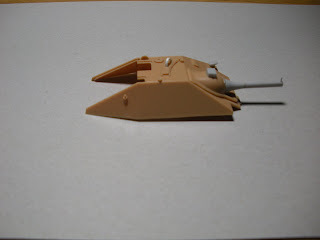 As mentioned before, the hull of the UM model is longer and wider than the Fujimi jagdpanzer by 2 mm in each dimension. I've been able to sneak in a little modeling here and there this week, and have gotten a little further on a couple of projects. The FSV I started earlier this month is almost done. I replaced the barrel with a piece of brass tube, and sliced up the end of the old plastic barrel to make some discs to simulate lights. I added the smoke dischargers because they look cool, even though most pictures of FSVs in the field show them without dischargers. I also added a pin to the driver's hatch to allow it to swing open and shut. I have to say that individual link tracks are a royal pain. I can't even begin to count the number of times I had to go looking for little tiny links that fell on the ground somewhere while trying to assemble the tracks for this model. I replaced the incorrect headlight with one fashioned from a bit of sprue and a piece of wire. I managed to make a right mess of the photoetch left fender piece. In my own defense though, I'll have to admit that this is the first time I have worked with photoetch parts. I'm debating whether to add the second photoetch fender, since the right fender of the jagdpanzer in my photo reference seems not to have it. In fact, the fender looks like it is just a sheet metal replacement, so I'm not sure how I'm going to handle it. I'll probably just do the photoetch, since I'm not modeling the exact vehicle in the picture anyway. 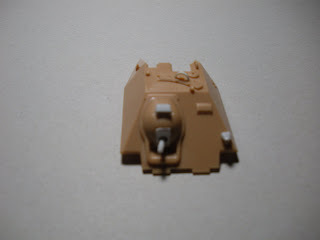 The machinegun shield is from the Fujimi kit, since the photoetch sprue for the flammpanzer does not come with a shield. I decided to put together my Aussie FSV produced by J.B. Models even though I have a slew of other unfinished models on the bench. The FSV is a standard M113A1 chassis mated with a Saladin turret. I originally bought the kit with the intention of sticking the turret on one of my ESCI M113 A1s, but taking a closer look at the J.B. kit, I realized that it was almost the same size as a 1/72 M113. In fact, on instruction sheet it says that the kit is 1/72! Anyway, the reason I wanted to start this kit was because it only had a few parts, and the color scheme is very basic. Here is the partially assembled kit next to a Trumpeter M113ACAV. It is about 1 mm smaller in length and width, but just a bit taller. The barrel of the 76mm gun appears to be completely misshapen. I will cut it off where the conical portion begins (actually this is supposed to represent a canvas sleeve), and replace it with some brass tubing. I'll probably add some new lights as well. The side skirts will be left off, since most FSVs seem not to have had them in the field.